The painting you are viewing is an oil sketch straight from the subconscious pit of Mondoexpressionism. 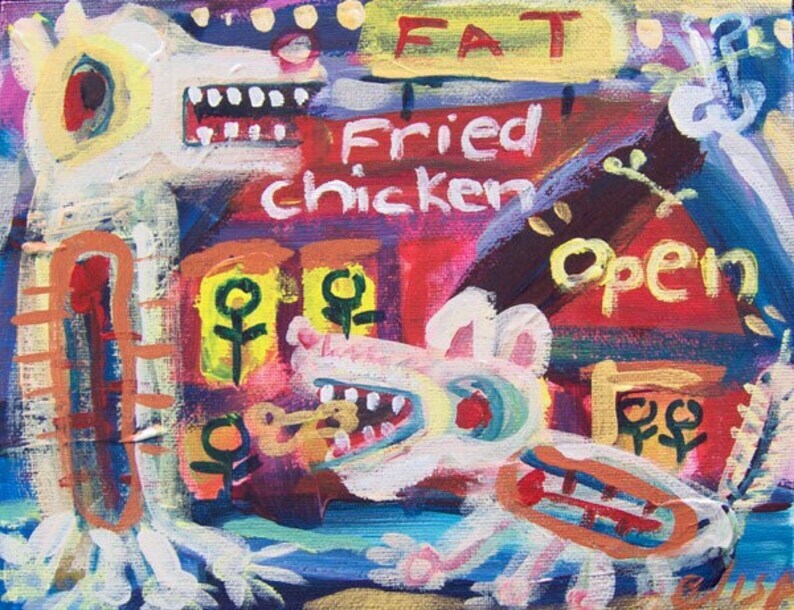 These are quick stream-of- consciousness paintings which can loosely be compared to the "Art Brut" or "Outsider Art" style of painting. The artist frees her mind of nearly all cultural constraints and paints an image which is raw, untainted, and unrestrained. This painting is so visually powerful given the simplicity and boldness of the colors and forms. It makes me happy because it's so unique and mixed with a cup o' crazy, lol. I will be buying more of this artist's work. She is gifted and an amazing artist. My children will be fighting over this so I better get another!! Thank you Elisa. Amazing piece. I just love it! I adore Elisa's paintings! I have 2 now and they're quite a conversation starter! I accept Paypal for payment on all items. If you do not like your mondo art you may return for a refund. Buyer pays all shipping costs. Most items are shipped USPS priority mail with delivery confirmation. Cost is based on weight according to USPS shipping rates. See individual auctions for details.Paypal preferred. Multiple item shipping discount for small paintings and drawings is $1.00 each additional. Large paintings are not eligible for a multiple item discount since each item must be mailed separately. Combined shipping discount is $1.00 each additional. Multiple purchases of four or more art trading cards can be mailed up to 13oz USPS First Class for $4.00. Anything over 13oz must go USPS Priority Mail and that will cost $7.00.